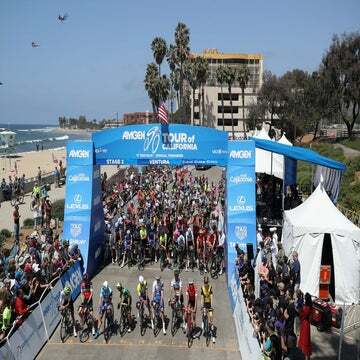 SANTA BARBARA, California (VN) — Colombia’s next star cyclist ascended to his first WorldTour road stage win on Monday. 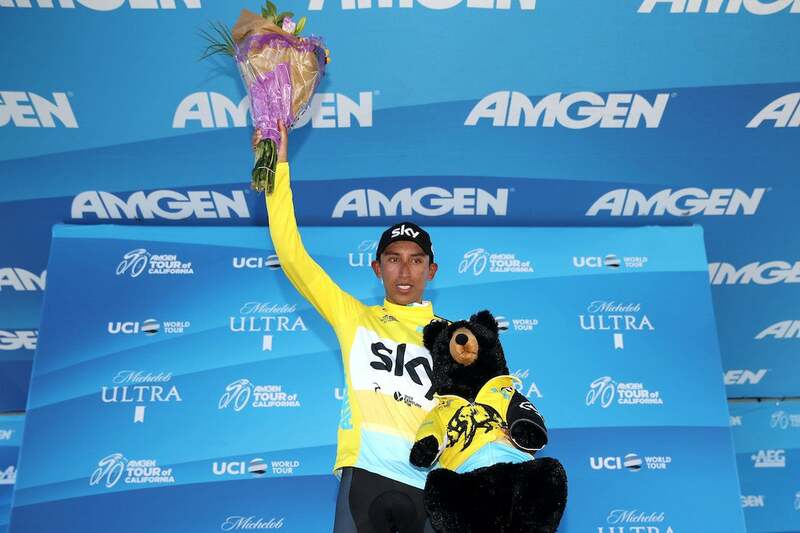 On the brutally steep switchbacks of the Gibraltar Road climb, Team Sky’s Egan Arley Bernal floated clear of the Tour of California peloton two kilometers from the finish of stage 2 and held on to a healthy advantage to snag the win. For fans and media gathered at the top under sunny Southern California skies, it was little surprise to hear Bernal’s name blared over the speakers. He’s been the talk of the press room not just in California, but in other races all year. Still, it’s no mean feat to confirm that potential out on the road — and Bernal’s made a habit of doing that this season. Last month, he powered to a WorldTour time trial win and second overall at the Tour de Romandie. On Monday, he left grand tour climbing stars like Adam Yates (Mitchelton-Scott) and Rafal Majka (Bora-Hansgrohe) behind on the steep stuff in California. For all the expectations lumped on his shoulders by the growing hype, Bernal just wanted to test his climbing legs and seeing how things might play out. Even for a WorldTour rookie, Bernal is quite young at just 21 years of age. The grand tour-type ability he’s shown in his first few months with Sky — and before that in two years with Androni Giocattoli — has started to garner plenty of international attention, even as he is yet to ride a single three-week race. Bernal is no stranger to flashing potential, or to confirming it, as a youngster. His father, Germán, tried to make a career out of bike racing in Colombia years ago but wasn’t quite at the level required to make a living off of the sport. After leaving racing behind, however, Germán passed on his love of cycling to his son. Bernal entered his first race at age eight. He had to borrow a few pesos to pay the registration fee, and that wasn’t all. “I didn’t have a helmet, so I went to someone else to borrow one,” Bernal told VeloNews this week in California. “It was huge on me. It was so big it came down around my eyes and I couldn’t see. In the end, I won — but I couldn’t see anything and I didn’t even know the race was over. Initially, Bernal directed his attention toward mountain biking, his first love. He ultimately rode his way to a few world championship medals as a junior. “I owe a lot to mountain biking. It’s because of mountain biking that people knew who I was,” he said. Bernal says his upbringing in Zipaquirá, a mid-sized city not far from Bogotá, was a “lower-middle class” one. He stresses that he never wanted for the basics and did not grow up poor — but if something on his childhood bike broke, he’d have to fix it rather than popping over to the local bike shop for a replacement. From that perspective, things got much easier once he began turning heads as a racer, although a pro road contract brought challenges of its own. Androni Giocattoli manager Gianni Savio spotted Bernal in his late teens and signed him to a Pro Continental deal. Bernal moved to Italy and showed his immense potential with a slew of results in under-23 races and lower-ranked elite events, all while trying to get comfortable living in a new place. “When I got to Europe, I was 19. I arrived in Italy without speaking Italian, without knowing anyone, without knowing the roads,” he said. Flashing his talent with Androni Giocattoli for two years, culminating in a Tour de l’Avenir win in 2017, Bernal was on the fast track to the WorldTour. With sports directors around the peloton raving about his potential, Savio decided to make a slick return on his investment. Sky agreed to pay the Italian squad a “development fee,” and inked Bernal to a WorldTour contract. The raving about Bernal’s skillset, and his personality has continued at his new digs. Bernal shot out of the gate with his new team this year. He rode to sixth overall and the young rider’s jersey at the Santos Tour Down Under and then claimed the Colombian national championship time trial. He toppled several well-known compatriots — Nairo Quintana (Movistar) and Rigoberto Urán (EF Education First-Drapac) included — to win the overall title at the UCI 2.1 Colombia Oro y Paz in February. He was riding towards second overall at the Volta a Catalunya before crashing out on the final stage, but returned with a vengeance to win the Tour de Romandie’s stage 3 time trial and take second overall. At least for now, Bernal has stayed humble, despite the growing hype in the cycling media. “It’s all been a surprise since Oro y Paz,” Bernal said. “Winning that race and everything that’s come after has been a big surprise. Romandie was special because I came into the race without having been able to train well [after the crash]. If he can deliver another strong ride against the clock this week in California, Bernal could be in for his first career WorldTour GC win. It won’t be easy on the mostly flat parcours of stage 4, but Bernal says he’s made big strides against the clock since joining Sky. He pointed out that he probably wouldn’t have been able to win the Colombian TT title last season. No matter what happens for the rest of the week in California, Sky has to be pleased with what they’ve seen so far this year, and so far this week. Sooner or later, Bernall will have his shot at stretching his legs in a three-week race. That may happen this year. Bernal stresses that he’d rather not get ahead of himself. Asked whether he thinks he can contend in the three-week races, he was quick to pump the proverbial brakes. 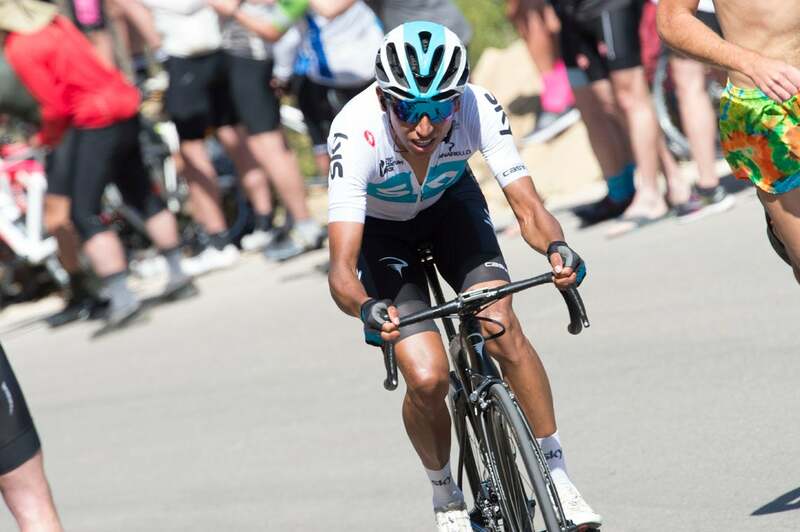 Bernal expects to race either the Critérium du Dauphiné or the Tour de Suisse in June, and then depending on how things play out, Sky may give him his first taste of grand tour racing at the Vuelta a España. Bernal is not in a huge hurry. He’d love to make his grand tour debut, but he says he’s the kind of person who only likes to do something if he can do it well. For now, he’s laser-focused on getting more out of the Tour of California. For all the success he has enjoyed this year, it’s actually been one of his first chances at outright team leadership. Considering the kit he rides in, he knows how much that’s worth, and how important it is to deliver. “At the beginning of the races [this season], I was more of a second option behind the leader, in case something happened. At Oro y Paz, the leader was Sergio Henao, and then afterward I was able to get some time and they gave me a free role. In Catalunya it was the same,” he said. Indeed, Bernal certainly seems to have the right perspective to pair with his VO2 max — which is reportedly muy impresionante — and his legs. That will come in handy as he continues to garner more and more attention winning races at the head of one of the sport’s most recognizable squads.